Attention to all Klang Valley Beauty Bloggers! Sasa is going to select some lucky pink peeps to go reviews on NATIO! Sasa has set aside some CLAY & PLANT FACE MASK PURIFIERS for their Guest Review campaign. 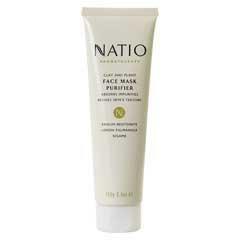 The Clay & Plant Face Mask Purifier is one of the stellar products from this Australian Aromatherapy Skincare brand. Features / Ingredients: Rich in minerals, pure Australian clay; Sesame, Lemon & Palmarosa. Plant Extracts: Sesame to nourish and restore lustre. Lemon to cleanse and purify. Palma Rosa to soften and nourish. Benefits: Rejuvenates tired skin as well as improves the skin texture. Helps unclog and tighten pores. Does wonders for tired skin, improving firmness and texture. A wonderful at-home treatment for all skin types. Directions for use: After cleansing and toning, apply a thin layer to face and neck, avoiding eye area. Relax for 10-15 minutes, allowing clay to dry. Rinse thoroughly with warm water. Recommended to use 1 – 2 times a week.